Are you reading this on a smartphone, tablet, or laptop? Yes? Cool. That glowing misery rectangle has the capacity to explode the same way Milwaukee woman Dina Mitchell’s Fitbit Flex 2 did last week. Any lithium-based rechargeable battery can. It’s just extremely unlikely. The shoddy manufacturing practices around “hoverboards” and vapes made exploding batteries known to consumers, and Samsung’s disastrous Note 7 debacle cemented flaming lithium-ion cells in the popular consciousness. But Mitchell’s case is a grim reminder that oh right—wearables. Fuuuuuuuuck. So should we all run screaming from Snapchat’s Spectacles for fear they’ll one day render us maimed or blind? Jokes aside, most of the publicized battery fiascos of the last few years were the result of shoddy design. Any battery can explode, but almost none ever do. And to the best of our knowledge, nothing like this has happened with a commercial Fitbit product so far. We have spoken with Ms. Mitchell and are actively investigating this issue. We are not aware of any other complaints of this nature and see no reason for people to stop wearing their Flex 2. We will share additional information as we are able. We were unable to reach Mitchell but reached out to Aurora for a statement on her condition and will update if we hear back. 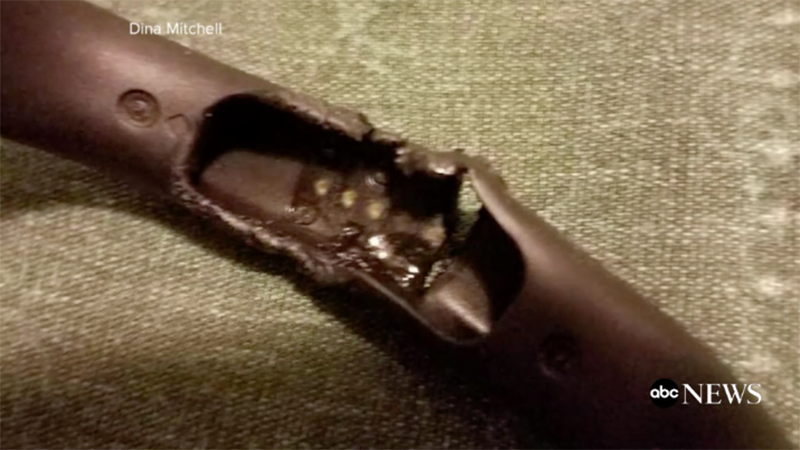 Update 4/28/17 5:03pm ET: Fitbit supplied a statement to Gizmodo in which the company claims to have tested the exploded wearable fitness tracker through a “leading third-party failure analysis firm” and found that “external forces caused the damage to the device.” We’d tell you what to avoid doing to your Flex 2 if you’re not into embedding parts of it into your wrist, but “external forces” could mean just about anything.